We make the highest quality instrument and audio cables you will find, made with the most reliable and tonally pure wire and ends. All of our cables are road-worthy and studio-quality. We don’t make any compromises with your tone, so why should you? Our instrument cables are dead silent. No added interference, static, or noise from moving around on stage. Properly terminated Canare or Mogami cables with rock-solid Neutrik plugs make our cables nearly indestructible. 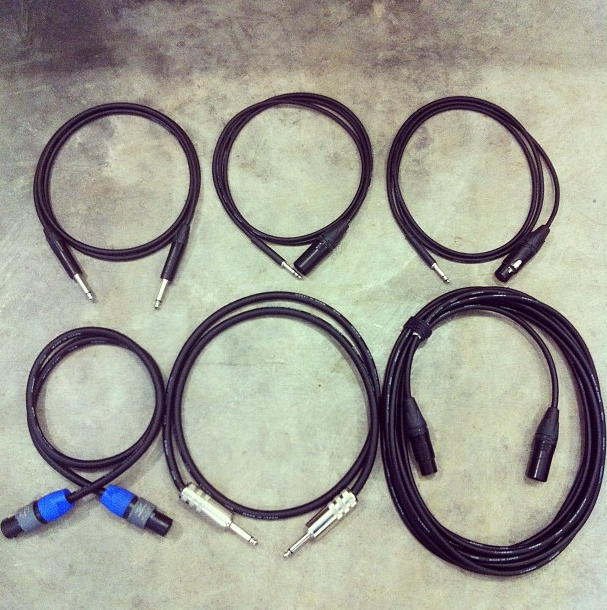 These are the only cables we use in the shop because they allow us to hear our amps with NO added noise. Our heavy duty patch cables promote clarity throughout your pedalboard. Made from Mogami or Canare cable with premium Amphenol or Neutrik connectors, these cables will hold up while on the road and allow you to focus on what matters most – your performance. The connection between your tube amplifier and speaker is the most important connection in your rig. Not all speaker cables are created equal. Our speaker cables are made out of rugged Canare cable and jumbo connectors to ensure durability that stands the test of time. We use a special kind of cable that acts much like a humbucker and reduces unwanted noise that many speaker cables add between your amplifier and speaker. Think of this as your last line of defense against noise. Most body pack cables can’t stand up to the abuse they see on the road. Ours are designed to withstand the beating you give them each night and out-perform those you’ll find at other music and tour gear stores. Need a bullet-proof mic cable for your stage or studio? Look no further than these. Utilizing the fantastic line of Neutrik connectors and Canare’s line of star-quad cable, you’ll have a great sounding interconnect with superb noise performance up 10 times better than a regular microphone cable. If you have any questions regarding our cables and accessories, or would like to place an order, please email us at info@newvintageamps.com or call (218) 428-8203 Monday from Noon to 5 PM and Tuesday-Friday from 9 AM to 5 PM.